Have you ever seen a motorcycle doing a fierce striptease?? 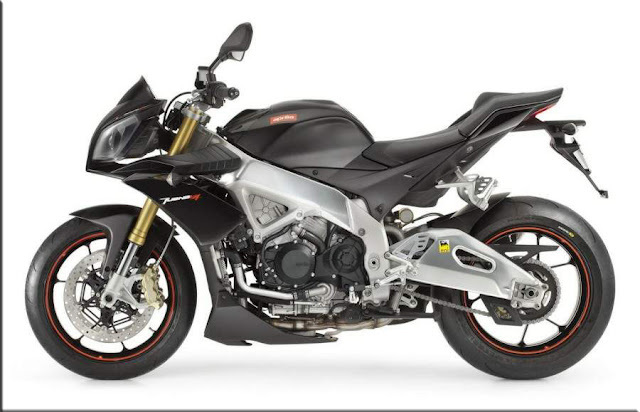 Well then, the 2011 Aprilia Tuono V4 is just gonna surprise you on that. It's a super bike with bare necessities. From nose to tail, it's a complete wild seduction. Just slap the removed fairing bits, and you have the Aprilia RSV4 in front of you. So, is it really the Aprilia RSV4 sans the fairing. Let's look at the tech specs. 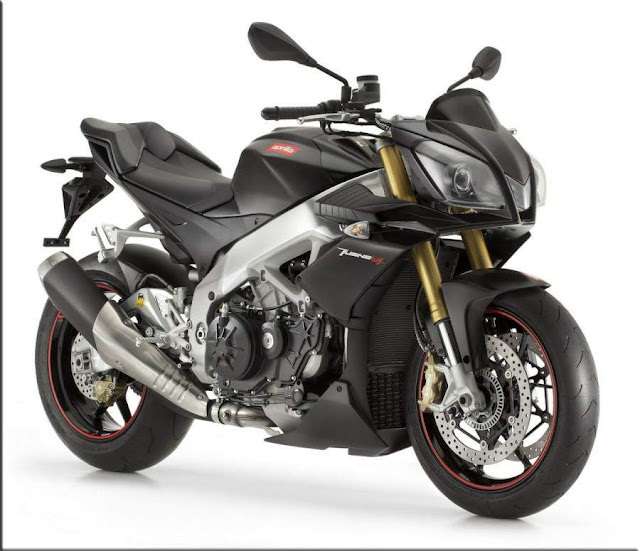 The heart of the Tuono V4 exudes power, never before demonstrated by a street naked, achieved by reconfiguring the factory RSV4 APRC (Aprilia Performance Ride Control) SE four V cylinder. The APRC allows the rider to extract the full motorcycle performance in any condition with the help of the ECU, which senses the dynamic riding condition with the help of an automotive inertia platform, two gyrometers and two accelerometers. The APRC package includes, Aprilia Traction Control (ATC) with eight selectable levels, which controls sliding when accelerating out of curve in relation to the bank angle and the throttle aperture, the Aprilia Wheelie Control (AWC) which controls the bikes front wheel from kissing the sky abruptly, by bringing it down gradually, the Aprilia Quick Shift Control (AQS) which allows the rider instantaneous up shifts without closing the throttle or using the clutch. Last, but no way the least is the Aprilia Launch Control (ALC), which is literally a missile launch system implemented on a production bike. By pressing two switches available on the joystick on the left handle bar, simultaneously, the engine gets armed and the rider can unleash the full 162 hp as soon the clutch is released. The 2011 Tuono is also equipped with the Special Edition new exhaust system (which in my opinion looks way better than the RSV4) with bypass valves, making the system 2 kilos lighter than the factory RSV4 R. It also features the latest Ride by Wire Throttle Control from Aprilia. Closer spacing between the first three gear ratios allows the 2011 Tuono achieve it's max torque of 110 Nm 1000 rpm lower than its fireball sibling. The job of braking is done by 2x320mm floating discs up front with Brembo radial mount calipers and 220mm single disc back rear. Sachs USD forks with 43 mm stanchions coated with titanium nitride for reduced friction. There is no doubt that the 2011 Tuono is a killer both in terms of performance and looks and we would have to wait till the bike is made available for test rides internationally. 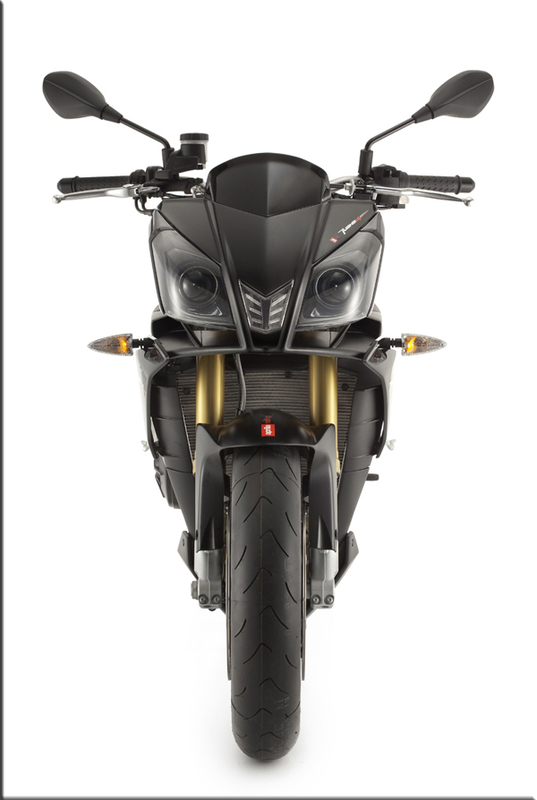 Personally I feel that the head lamp section could have been detailed out a bit more, but never the less, if you ask me, the I'll choose the Tuono over the RSV4. Watch out for more on this feminine beast on Throttle Quest.